Russia is developing new intercontinental ballistic missiles (ICBM) specifically designed to penetrate U.S. missile defense systems, Russian Commander of Strategic Missile Forces Colonel-General Sergei Karakayev told Russian state-owned news agency TASS on Tuesday. “This is conditioned by the fact that the United States is not stopping after what it has achieved and continues improving its missile defense system, including the deployment of its elements in Europe. That is why special attention in the development of new missile complexes is paid to the issue of overcoming the missile shield,” Karakayev said. As I reported previously, Russia announced in January that it would conduct a total of 16 ICBM test launches in 2016 with 14 dedicated to testing new missiles and warheads (See: “Russia to Launch 16 Intercontinental Ballistic Missiles in 2016”). The Strategic Missile Forces are also holding more than 100 command and staff, tactical and special exercises throughout the year. According to Karakayev, the Russian military is introducing new types of warheads with a difficult to predict flight path in order to overcome U.S. missile defenses. “This is achieved both through the ICBM’s shorter acceleration phase and new types of warheads with a hard-to-predict flight trajectory and new means of overcoming the missile shield,” he said. By 2021, the Strategic Missile Forces (SMF) plan to have an equal number of stationary and mobile ICBM systems. “Considering the ratios of stationary and mobile groupings of the Strategic Missile Forces, it can be noted that at the turn of 2021, the quantitative indicators of these groupings will come to equal each other. However, the capabilities of the stationary grouping will continue to be higher due to the availability of heavy missiles,” Karakayev noted. 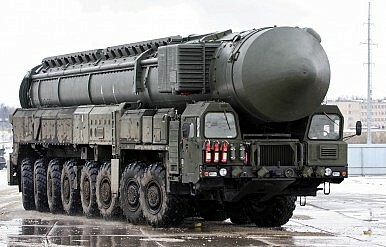 The RS-12M2 ICBM (the Topol-M missile system), along with the RS-24 Yars (SS-27), is slated to become the mainstay of Russia’s Strategic Missile Forces in the years ahead. “By late 2021, the Yars missile system will make up about half of the SMF effective combat strength,” according to the colonel-general. The RS-24 Yars can carry multiple independently targetable nuclear warheads and was first introduced into service in July 2010. By 2018, 70 percent of the SMF ICBM force will be upgraded and modernized, Karakayev claims: “The successful implementation of rearmament measures will build up the share of advanced missile complexes from 56 percent this year to 70 percent by January 1, 2018 and to 100 percent by 2022.” He also said that Russia’s modernization effort is a direct response to the growing sophistication of Western missile defense systems. Russia is in the middle of modernizing its strategic and nonstrategic nuclear warheads. According to the Bulletin of the Atomic Scientists, Moscow has currently 4,500 nuclear warheads, of which roughly 1,780 strategic warheads are deployed on missiles and at bomber bases. An additional 700 strategic warheads are kept in storage along with approximately 2,000 nonstrategic warheads. “Russia deploys an estimated 311 ICBMs that can carry approximately 1,050 warheads,” the Bulletin of the Atomic Scientists further notes. The SMF’s most powerful future weapon will be the RS-28 Sarmat, Russia’s newest super heavy liquid-propelled ICBM, currently under development with first test-launches scheduled for later in the year. “The development of the Sarmat silo-based missile system with a heavy missile is nearing completion,” Karakayev said. “The performance of the stationary grouping of the heavy ICBM (of the Voyevoda or Sarmat class) will four times surpass that of the stationary grouping of the light-class ICBM (Topol-M, Yars) by all the RVSN grouping tactical effectiveness parameters,” he added. The Sarmat purportedly can carry ten heavy or 15 lighter warheads and is expected to become operational by 2020.